What are some reasonable ways of understanding and operationalizing "impact" in connection with an organization like the National Institute on Money in State Politics? What kinds of insight can be gleaned from the Institute's stakeholders and data users, to the end of improving the Institute's products and its impact? The National Institute on Money in State Politics collects, processes, and makes public information on campaign contributions made to state-level candidates for public office. The Institute asked the RAND Corporation to probe user perspectives on the Institute and its data, on how the data are being used, and on how the utility of the data might be improved in the future. Drawing on experiences of a variety of users, as well as a review of the publications that have used the Institute's data and research reports, this report provides an evaluation of the Institute's impact on the public discourse over campaign finance at the state level. It is our view that the Institute serves an important purpose — to undertake the collection, centralization, and dissemination of state-level campaign finance data. No other organization has been successful in this effort or is likely to be so. All the audiences that the Institute seeks to engage have found value in the Institute's efforts. The most successful of these are the scholarly, journalistic, and advocacy communities. The interviewees we spoke with were impressed, felt indebted to the Institute, and expressed an inability to do the sort of research, reporting, and advocacy on state campaign finance without the Institute. Overall, a variety of influential users engaged in campaign finance and public policy view the Institute's work as being of high quality and adding value. Assessing the impact of this resource is about more than counting hits on a website. The institute's broad goals are to raise awareness, inform, and enable insight. Those using the data include academics, the media, and the public. The fact that so many and so varied users find value in the data and transform the Institute's resource into new efforts and new ideas is a testament both to the importance of the data themselves and to the Institute's efforts and impact. In an environment of limited resources, the Institute should triage outreach efforts to identify the right mix of awareness, interest, and capability. The general public may be more effectively reached through partnerships with voter education organizations. Journalists, bloggers, and news media should continue to be priority audiences, with special attention to leveraging new and social media. The academic community is a permanent audience for the database. Some advocacy groups likely would not exist without the Institute's data; sharing resources should be a priority. The research described in this report was conducted within the RAND Institute for Civil Justice. The center is part of RAND Justice, Infrastructure, and Environment, a division of the RAND Corporation. 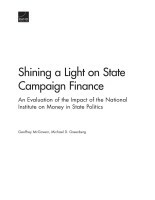 McGovern, Geoffrey and Michael D. Greenberg, Shining a Light on State Campaign Finance: An Evaluation of the Impact of the National Institute on Money in State Politics. Santa Monica, CA: RAND Corporation, 2014. https://www.rand.org/pubs/research_reports/RR791.html.